An exceptional quality digital piano with all the professional features of name brand alternatives at an attractive price. 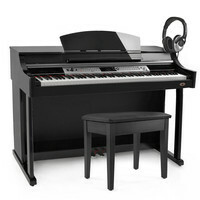 This stunning polished ebony digital piano from Gear4music features 88 professional standard fully-weighted keys soft sostenuto and sustain pedals three levels of touch control and thirty one levels of reverb and chorus providing both a top-of-the-range feel and sound. Pack comes complete with piano stool and headphones.